Have you ever opened your medicine cabinet and found something that you do not remember buying? You examine the package looking for an expiration date and find it expired two years ago. Many of us accumulate medications and over-the-counter items for those “just in case” moments. Those medications, however, may be harmful if they are expired or taken by someone other than for whom they were prescribed. There have been multiple cases where a medication was taken accidentally, resulting in poisoning or overdose. Also, abuse of prescription drugs is the second most common form of drug abuse in America and these medications are often taken from the home of a family member. It is a good idea to go through your medicine cabinet every six months to remove any items that are either no longer needed or expired. Almost all of the products in your medicine cabinet, including creams, supplements, and vitamins, have an expiration date from the manufacturer. For prescription drugs, most pharmacies put a one year expiration date on the bottle. Beyond that date, the medication may lose its effectiveness and can even be toxic. 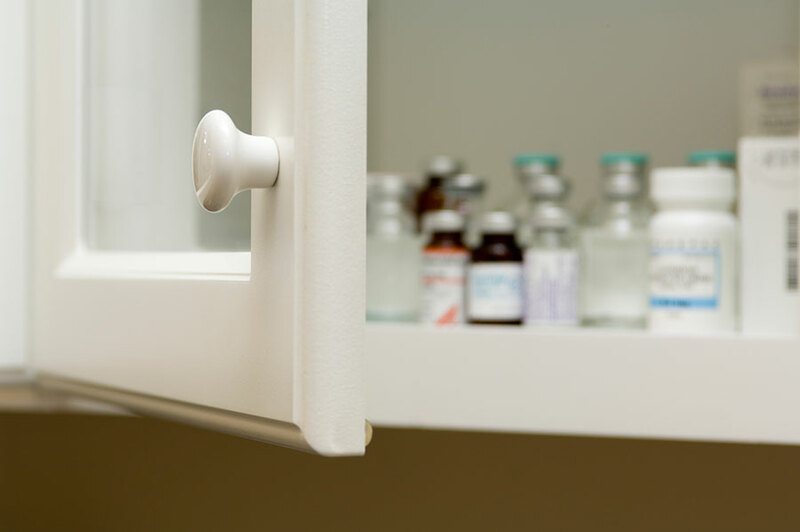 Once you have removed all the unwanted items from your medicine cabinet, how do you get rid of them? The best way is to take them to an authorized disposal site. There are multiple locations across the state and the list can be found on the Rhode Island Department of Health website. Many pharmacies also sell medication take away envelopes that include a prepaid shipping label and allow for safe medication disposal by mail. Take the medication out of its original container and mix it with an undesirable substance like kitty litter or coffee grounds. Put the medication into a disposable container with a lid or sealable plastic bag. Conceal or remove any personal information on the empty containers. Put the sealed container or bag and the empty containers in the regular trash. Due to environmental concerns, most drugs should not be flushed down the toilet. However, the Food and Drug Administration recommends flushing certain prescription pain medications immediately after they are no longer needed to prevent accidental ingestion or overdose. Read the label on the bottle to determine whether it should be flushed. Another way to dispose of old medication is through a drug take back program. An example is the Drug Enforcement Administration (DEA) National Rx Take Back Day. This national program is held at various times throughout the year at participating local law enforcement agencies. This program allows individuals to drop off unwanted medication at collection sites and have them disposed of, no questions asked. Visit the DEA Take Back Day website for information on the next scheduled event and to locate a collection site near you. Both Newport Hospital and The Miriam Hospital serve frequently as collection sites for National Rx Take Back Day. Your local pharmacy or law enforcement agency may also be able to assist in locating a collection site or disposal of medications. Taking the time to go through and dispose of old medication is an easy way to help prevent medication-related illness or injuries. Disposing of prescriptions the right way is better for the environment and your family. In the warmer months, please consider adding the medicine cabinet to your spring cleaning list. If you have any quesions, you can check in with the staff in our pharmacy. Learn more about Lifespan Pharmacy here. Vincent Salerno is the ambulatory pharmacist in charge at the Lifespan Pharmacy at The Miriam Hospital.